Forging involves the repeated and controlled hammering of a piece of metal, often steel, to manipulate its shape. If the faces of the hammer used are suitably textured, its texture is imparted onto the metal with each and every blow. Slight variations in the position and strength of the blows become evident in the pattern produced. This method is particular effective at creating bark textures for commissions based on organic forms such this steel vine . 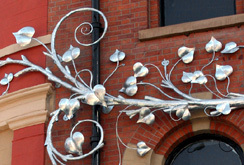 The wall sculpture shown above was commissioned by Afflecks Palace and makes using this technique, as does the mixed metal sculpture shown beside it. The stainless railings also make use of this technique to create a texture that picks up on the dry stone they sit on.